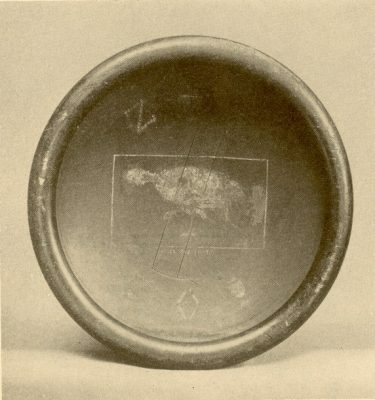 December 1869 was the first time when the bowl was broken. In this year the bowl man, Mr. James N. Stone, Class of 1973, escaped promptly after his name was read out. Later he was brought back to the campus where, instead of submitting peacefully, he seized the bowl and broke it by throwing it on the floor. Thus, for the first time in the history of the bowl fight, a bowl was broken. 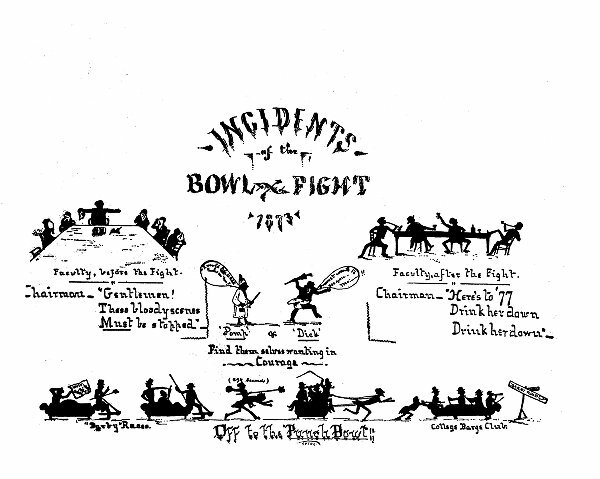 In 1872 another interesting thing happened in the bowl fight between the classes of 1875 and 1876. Though the course of the fight was in no way different from the other fights, the end was indeed very surprising for two reasons. First, the bowl man, Mr. Edward Hazlehurst ’76, just gave in and allowed himself to be put into the bowl; and to add to the surprise the bowl was also broken not by a freshman, but accidentally by a sophomore. The fights of 1873 and 1874 made a lot of people averse to the bowl fight. The fight of 1873 was so fierce that the Provost himself could not refrain from interfering. When the battle was in full force, he went in to stop some of the most brutal fighters. But all his efforts were in vain as nothing could stop the bowl fight once it had started. The ensuing fight resulted in a broken bowl and a nearly asphyxiated bowl man. In the fight of 1874 the bowl man, Mr. Henry S. Jefferys, Class of 1978, just barely escaped having his brains knocked out. Nothing, not even the fact that the bowl was broken, could stop Mr. Jefferys from publicly condemning the violence and futility of the bowl fight. From this year on public sentiment against the bowl fight started to grow. The fight that occurred in 1879 between Classes of 1882 and 1883 was almost an equal affair. After all the combatants were exhausted a draw was called, both sides agreed to the decision, and the bowl was handed over to the Philomathean Society. It remained with the Society until the members of the Class of 1882 were in their senior year. Then students in the Class of 1882 who were also members of the Philomathean Society decided to vote the bowl back to their class so that it could be presented on their Class Day. On hearing this, the Class of 1883 quickly fought back by engaging the services of counsel (Messrs. Lewis and Landreth). Their suit to prevent the Class of 1882 from alienating the bowl from the Philomathean Society was heard before Judge Allison . The resulting decision kept the bowl in the hands of the Philomathean Society but allowed the Class of 1882 to exhibit the bowl in their Class Day. From that year onward the sophomores held the right to present the bowl to the second most popular man in their class on Class Day. In many years, kidnappings occurred during the days before the Bowl Fight. 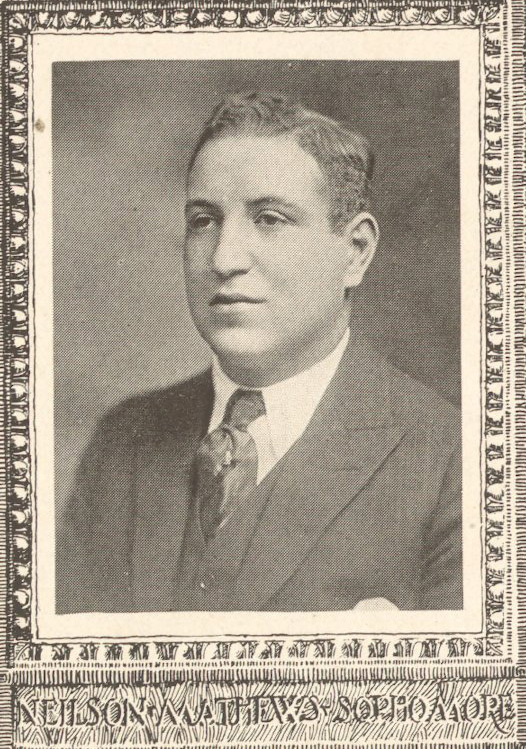 The people targeted were mostly class presidents and other members of the Class Board. These kidnappings could be considered more as a strategy to reduce the morale of the fighting team than anything else. They were carried out with essential good humor. 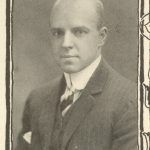 In 1909 Bowl Fight, both the freshman class president, Charles Coryell (shown at right), Class of 1913, and the sophomore class president, Emanuel Shoemaker, Class of 1912, were nowhere to be found a few days before the fight. As it turned out, the freshman president was actually kidnapped by the sophomores and the sophomore president was one of the kidnappers. The freshman class president was taken first to Trenton and then to Island Heights, where he was held on a small yacht on the Tom’s River. There both of the class presidents were guarded closely by the sophomores until the day of the fight. Contrary to expectations, the sophomore president made his way to Franklin Field during the fight. And while the fight raged on in Franklin Field, the poor freshman president was probably sullenly navigating the ocean waves. 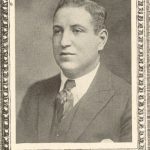 Similar events took place in the 1910 Bowl Fight. The freshman class president, this time W.H. 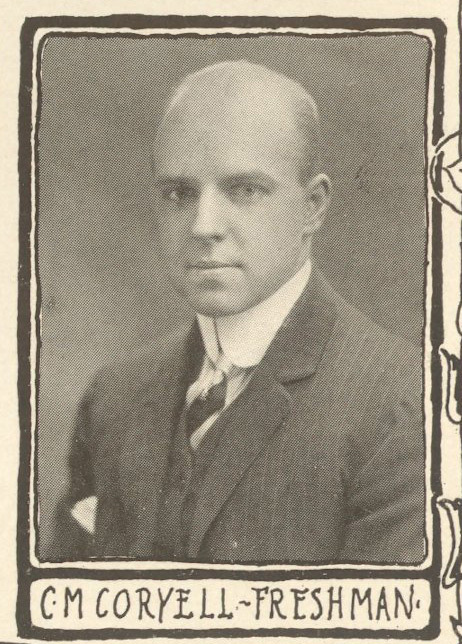 Dougherty, Class of 1914 (shown at right), was invited to and then kidnapped during a yachting trip. Thus the freshmen went into this fight without their leader. 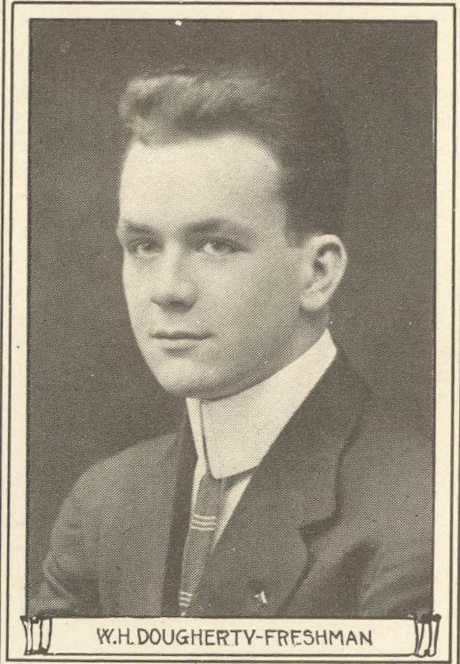 The sophomore president, “Pat” Murphy, Class of 1913, was no luckier either. Since the main entrance to Franklin Field was filled with freshmen ready to kidnap him, he tried to get into Franklin Field over the northern iron gates. During this daredevil stunt however he badly cut his right hand and thus was unable to lead the fight. However the sophomores could not lay their hands on the freshmen president, Walton ’15. When he appeared on the day of the fight disguised as an elderly man, he successfully boosted the morale of the freshman ranks. No wonder they won the fight! 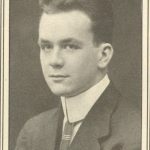 During the 1915 Bowl Fight, it was the turn of the freshmen to kidnap the sophomore president, N.M. Matthews, Class of 1917 (shown at right), from his own room and spirit him to an unknown place. The sophomores in turn kidnapped a number of freshmen, especially members of the football team and the rowing crew. Despite the sophomores’ numerical advantage, the fight ended in victory for the freshman.